Water is the common link among the five biomes and it makes up the largest part of the biosphere, covering nearly 75% of the Earths surface. Aquatic regions house numerous species of plants and animals, both large and small. In fact, this is where life began billions of years ago when amino acids first started to come together. Without water, most life forms would be unable to sustain themselves and the Earth would be a barren, desert-like place. Although water temperatures can vary widely, aquatic areas tend to be more humid and the air temperature on the cooler side. Freshwater is defined as having a low salt concentrationusually less than 1%. Plants and animals in freshwater regions are adjusted to the low salt content and would not be able to survive in areas of high salt concentration (i.e, ocean). There are different types of freshwater regions: ponds and lakes, streams and rivers, and wetlands. The following sections describe the characteristics of these three freshwater zones. The topmost zone near the shore of a lake or pond is the littoral zone. This zone is the warmest since it is shallow and can absorb more of the Suns heat. It sustains a fairly diverse community, which can include several species of algae (like diatoms), rooted and floating aquatic plants, grazing snails, clams, insects, crustaceans, fishes, and amphibians. In the case of the insects, such as dragonflies and midges, only the egg and larvae stages are found in this zone. The vegetation and animals living in the littoral zone are food for other creatures such as turtles, snakes, and ducks. Plankton have short life spanswhen they die, they fall into the deep-water part of the lake/pond, the profundal zone. This zone is much colder and denser than the other two. Little light penetrates all the way through the limnetic zone into the profundal zone. The fauna are heterotrophs, meaning that they eat dead organisms and use oxygen for cellular respiration. These are bodies of flowing water moving in one direction. Streams and rivers can be found everywherethey get their starts at headwaters, which may be springs, snowmelt or even lakes, and then travel all the way to their mouths, usually another water channel or the ocean. The characteristics of a river or stream change during the journey from the source to the mouth. The temperature is cooler at the source than it is at the mouth. The water is also clearer, has higher oxygen levels, and freshwater fish such as trout and heterotrophs can be found there. Towards the middle part of the stream/river, the width increases, as does species diversitynumerous aquatic green plants and algae can be found. Toward the mouth of the river/stream, the water becomes murky from all the sediments that it has picked up upstream, decreasing the amount of light that can penetrate through the water. Since there is less light, there is less diversity of flora, and because of the lower oxygen levels, fish that require less oxygen, such as catfish and carp, can be found. Wetlands are areas of standing water that support aquatic plants. Marshes, swamps, and bogs are all considered wetlands. Plant species adapted to the very moist and humid conditions are called hydrophytes. These include pond lilies, cattails, sedges, tamarack, and black spruce. Marsh flora also include such species as cypress and gum. Wetlands have the highest species diversity of all ecosystems. Many species of amphibians, reptiles, birds (such as ducks and waders), and furbearers can be found in the wetlands. Wetlands are not considered freshwater ecosystems as there are some, such as salt marshes, that have high salt concentrationsthese support different species of animals, such as shrimp, shellfish, and various grasses. Marine regions cover about three-fourths of the Earths surface and include oceans, coral reefs, and estuaries. Marine algae supply much of the worlds oxygen supply and take in a huge amount of atmospheric carbon dioxide. The evaporation of the seawater provides rainwater for the land. The largest of all the ecosystems, oceans are very large bodies of water that dominate the Earths surface. Like ponds and lakes, the ocean regions are separated into separate zones: intertidal, pelagic, abyssal, and benthic. All four zones have a great diversity of species. Some say that the ocean contains the richest diversity of species even though it contains fewer species than there are on land. The intertidal zone is where the ocean meets the landsometimes it is submerged and at other times exposed, as waves and tides come in and out. Because of this, the communities are constantly changing. 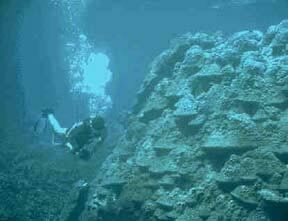 On rocky coasts, the zone is stratified vertically. Where only the highest tides reach, there are only a few species of algae and mollusks. In those areas usually submerged during high tide, there is a more diverse array of algae and small animals, such as herbivorous snails, crabs, sea stars, and small fishes. At the bottom of the intertidal zone, which is only exposed during the lowest tides, many invertebrates, fishes, and seaweed can be found. The intertidal zone on sandier shores is not as stratified as in the rocky areas. Waves keep mud and sand constantly moving, thus very few algae and plants can establish themselvesthe fauna include worms, clams, predatory crustaceans, crabs, and shorebirds.